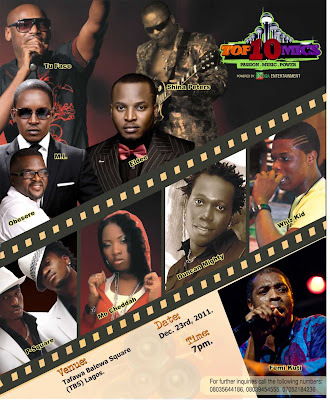 It has been weeks of high suspense, waiting, guessing, prediction and race to win array of prizes KOGA Entertainment put up as giveaways for those who correctly guess names of the remaining five artistes that will perform at the highly anticipated concert of 2011, the TOP10 MICS. It would be recalled that on September 9, 2011, KOGA Entertainment, one of the fastest emerging giants in the entertainment industry, released five out of 10 artistes that will be performing at the highly anticipated concert of the year come December 23 at TBS, Lagos. The five acts are African queen crooner, 2face Idibia, rapper, MI, Afro juju creator, Sir Shina Peters, Paramount King of Fuji, Obesere and Trybesmen honcho, Eldee. In a bid to engage the general public, KOGA Entertainment asked people to predict the remaining five artistes and win blackberry phones, mini laptops, TV sets and designer wears from Shakara Clothing. Thus, the race began, the competition ended last week Friday with no one getting the prediction right. ‘’ The weeks of the predictions were the most exciting weeks at Bigsam Media. Some people came close with their predictions, some had depths, some were funny while others were completely way off mark. We thank the people for participating and hope they will win gifts in the competition that will still follow this campaign’’. However, KOGA Entertainment has revealed the identity of the five remaining artistes that will be performing alongside 2face Idibia, Eldee, Sir Shina Peters, M.I and Obesere. Emerging Afro beat legend, Femi Kuti, will be leading the new generation artistes which includes Port Harcourt’s first son, Duncan Mighty, youngster, Whizkid, female singer, Mocheddah and the Okoye twins, P-Square in the concert that has been tagged the concert of the people, by the people and for the people. So, come December 23rd, at the expansive venue, Tafawa Balewa Square (TBS), Lagos, TOP 10 MICS concert will parade 10 leading lights in the Nigerian music industry namely 2face, Femi Kuti, Eldee Tha Don, Sir Shina Peters, MI, Duncan Mighty, Mochedah, P-Square, Obesere and Whizkid. In a concert that is akin to an eclectic collection of different genres of music ranging from hip hop to RnB, afro beat, juju, dancehall, pop, highlife and others. Koga Entertainment is staging a concert that has something for everyone. It is a departure from what is obtainable in concerts in Nigerian entertainment industry as most concerts only carter for hip hop and youth market. ‘ We are doing Top10 MICS for many reasons, long before now, some of us who are old enough still have memories of Lekki Sun Splash and other concerts at open venues where people enjoyed themselves, feel safe and look forward to the next edition. We are trying to recreate the memory of good old days with the infusion of contemporary offerings. Aside this, we are also trying to create a concert where everybody will have a sense of belonging. We are tired of events where only hip hop audience would be catered for. We want an event where fans of different genres of music could mix and experience the thrill of live performances of leading lights in different genres. Aside these two reasons, we figured that fans of these artistes are the people on the street who cannot afford to pay the exorbitant amount some concerts charge and just like people have tagged Top 10 MICS, ’ it is a concert of the people, for the people and by the people’. We are trying to bridge the gap between the public and the stars at a venue where they can afford, enjoy themselves and be safe” Anu Awoseyi an official of Koga Entertainment said. On security challenge Anu assured that it has been sorted as top security outfit has been engaged to provide security “we are using The Experience Concert Model as it is common knowledge that no single case of theft, injury, harassment has been reported since the concert started years back. So we are assuring the general public that safety of life and property will not be an issue as we’ve got all that covered. Meanwhile the concert is getting support from organizations like Beat FM, Cool FM, Wazobia FM, Naija FM, Bellanaija, Lindaikeji, Nigerianfilms, Ozone Cinema, LASAA, Swe Bar, Genesis Cinema, Olorisupergal, Thenetng, Lagbus, Shakara clothing, Ynaija, Soarnaija, Gabrielz 360 and many others. Linda, how much is the ticket? where do I get the ticket. Pls and pls, any number to call?